Founded in 1924. In 100 ha the life as it used to be is exposed: farmsteads, windmills, fishing villages, churches have been removed here from all over Latvia. 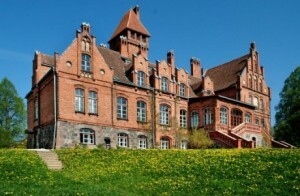 The baroque palace of Curonian Duke Ernst Johan von Biron, designed by Bartholomeo Rastrelli. The palace complex consists of the palace with its inner courtyard, the semicircular stables with a large household yard, and a formal park surrounded by a canal. The professionaly renovated palace interiors are decorated with authentic 18th cent. furniture, paintings and china. Jurmala – the largest resort city in the Baltic States is well-known for its natural treasures – the mild climate, sea, healthy air, curative mud and mineral water. The attraction of Jurmala hides in its almost 33 km long white sand beach, large pine forests and the natural border of the city – the river Lielupe. In Jurmala You will discover a combination of charming wooden houses built in the beginning of the last century and modern resort buildings. This is a step back to Latvian ancient and medieval times. Turaida was settled by ancient Livs, later it became a siege of Bishop. The remains of Bishop’s castle are preserved. All that area is Natural Preserve of river Gauja with a picturesque landscape. Kuldiga is one of the most beautiful towns in Latvia attracting tourist with its peculiar atmosphere: narrow streets, small craftsmen’s shops, wooden doors with amazing variety of ornaments, tile roofs and ancient weather vanes and the brightest waterfall in Europe – famous Ventas Rumba. Jaunmoku is a picturesque hunting mansion built for Mayer of Riga George Armitsted.